Looking for a great happy hour place? Auburn has many great restaurants serving up happy hour specials – have you tried ours? Here at Monkey Cat we are offering a great Happy Hour special. We have discounted appetizers like, Crab Cakes, Chili Lime Fries, and a Grilled Stuffed Portobello Mushroom! Looking to sate your thirst? Try any of our “well” cocktails for only $6! House Wine? $5 for a 7 ounce glass. Grab a Coors Light for only $2. 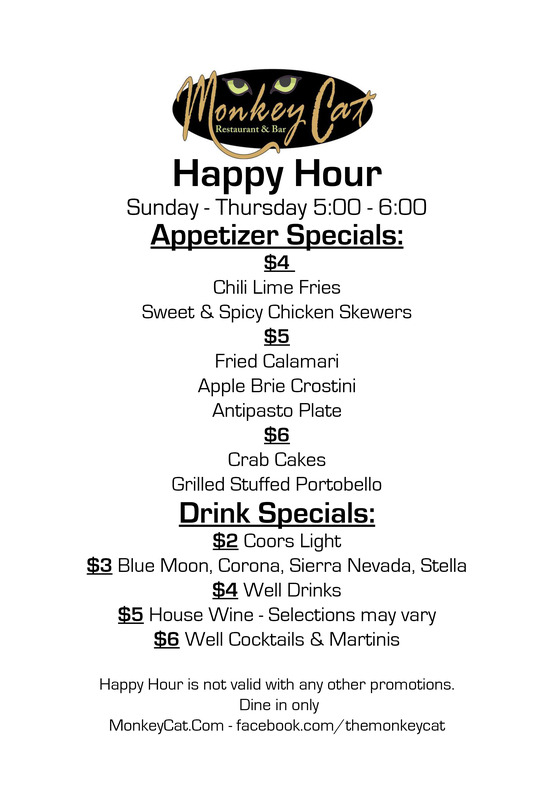 We are currently offering Happy Hour Sunday – Thursday from 5:00 – 6:00! So come sit in our cozy lounge, grab a seat at the bar or start off your meal with some Happy Hour. No Replies to "Happy Hour in Auburn, Ca"